In addition to being interested in the PR world (and other things, like food), I have a genuine interest in helping young students or graduates trying to figure out where they should take their PR career. I’ve already covered deciding if a PR agency specifically is a good fit here, but recently I was asked to speak with a young graduate who studied communication and has found her way headed into PR via a social media internship. It wasn’t her plan, but that’s often how life goes and she wanted to learn more about different options in the field. So whether you’re still trying to pick your major or are considering public relations after being in the real world for some time, here are a few tips to jumping into the communications field. Get Experience. Pick a career or industry that you think you might be interested in and apply for internships. Help out a friend who needs help promoting their small business or volunteer to publicize an event for the charity you are involved in. Even if you didn’t study public relations in college, experience can help you learn what you need to know for your entry-level position. Network. Get involved in organizations that help connect you with people that know the industry, such as PRSA. 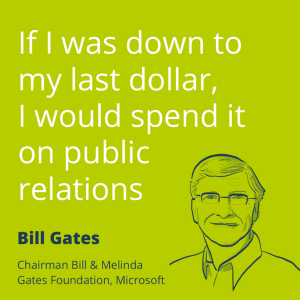 Ask family and friends if they know of anyone in the PR field – people are often eager to help and would be happy to connect you with someone if they can. After you meet people, connect with them on LinkedIn. Be Open. It’s great to have an interest in a specific industry or job and go after that, but make sure to remain open to other opportunities. You never know what you may end up loving. Interview, Interview, Interview. Any interview process is helpful for honing in on your skills of pitching yourself. Every job has a different process for interviewing, whether it is a group setting or interview rounds with different people and each is an opportunity to learn. Practice your selling points on your own and then practice sharing them in the interview process. Be Findable. Polish your LinkedIn and Twitter profiles. Hiring communications professionals look at these accounts during the interviewing process to see how you present yourself and see if you are engaged in the public relations community. Interested in working for Trevelino/Keller? Check out our Openings page. What other tips do you have to snag that first job?